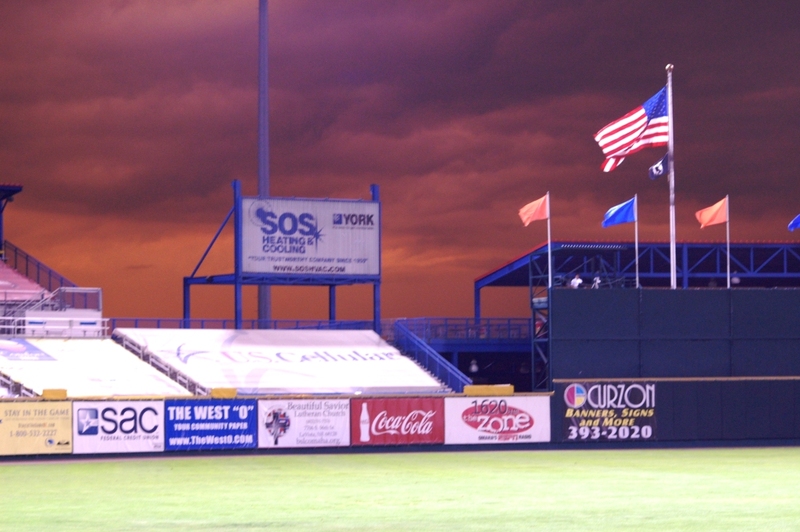 These sweet/ominous storm clouds eventually dumped on the Blatt Tuesday night. It’s hard to believe this day is actually here. I’ve tried all season to figure out how I feel about historic Rosenblatt Stadium going away, and I’ve wondered what this day would be like. So far, it’s normal: I’m half-listening to a class lecture and wishing I had eaten breakfast. Pretty typical. But what will tonight feel like? On a practical level, I’m ready to move away from the Blatt. The Omaha Somethings* will have a new home next year that will be an upgrade in every physical way possible: wider concourses, better facilities, modern amenities, bigger gift shop, and so on. Best of all, it will be a HOME for a team that has been chased out of its stadium every June for decades. *I hope the team will still be the Royals, but would accept a new name if it’s based on a Simpsons reference. Luv u, Albuquerque! 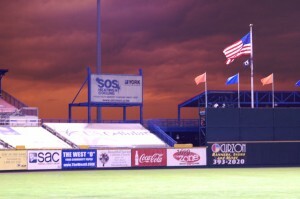 On the other hand, Rosenblatt has been my home away from home since I started college. I moved to Omaha on a whim at the end of my freshman year, got the job with the ORoyals, and can’t fathom doing anything else with my life. Rosenblatt is where I work; it’s where I play; it’s where I had my very first press pass and countless wide-eyed encounters with ballplayers I can’t believe I’ve gotten to meet. Heck, I even got to meet Dayton Moore earlier this season. It’s been at Rosenblatt that I’ve watched Omaha morph from a dumping ground for washed-up has-beens to a team full of prospects that’s chasing a pennant. And Rosenblatt is where I’ve met hundreds of brilliant, kind and memorable fans, some of whom have become actual friends outside of the stadium. The promo room, even though it’s tiny and often insanely messy, is as much “my” room as any of the bedrooms and living rooms I’ve stayed in over the past four summers. And beyond me, the stadium’s history is huge, obviously. Last season, Omaha welcomed the 11 millionth ORoyals fan through the front gates of the Blatt, which means that an astonishing number of Omahans and visitors have made the Royals a part of their Omaha experience over the last 40+ years. Lots of those have met new friends and even future spouses at the stadium. People have gotten engaged there, and even married there. I have no idea what I’ll feel like tonight after the final out is made. I’m excited for the team’s future home, but moving out of a beloved old home – even one that leaks and creaks and is hard to get around in – is never easy.